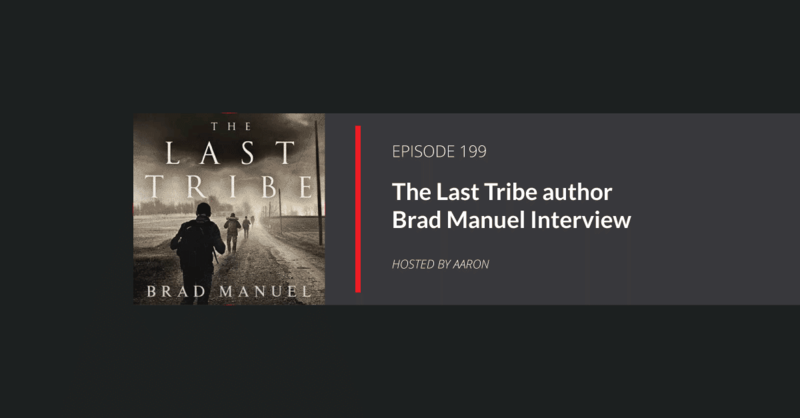 In this episode, we sit down with author Brad Manuel. He’ll share with us how he crafted a different kind of post-apocalyptic book. There are no super-elite-range-seals. No ninja warriors. Just regular folks trying to survive. But somehow it still caught the attention of the audio publishers of The Martian. So he might just be on to something. But The Last Tribe isn’t necessarily for everyone for the reasons mentioned above. This is not a high-action prepper book. It’s more about character development and overcoming adversity. And it deals with a few issues few if any, other books in the genre attempt. Who is Author Brad Manuel? How did he become an author? What drew him to writing apocalyptic fiction? Why did a reviewer of his book call it the “Life Time TV” of post-apocalyptic books? Why did he write a book low of violence in a genre dominated by violence? What’s the best advice about making it as an author did Brad ever receive? What’s the best thing Brad has spent, or not spent, money on as a self-published author? Get your free audiobook and 30-day Audible trial by using the banner below. Over 180,000 titles to choose from for your iPhone, Android, Kindle or mp3 player. It is fast and easy. But fair warning, you will become addicted! As a former warmongering, piratical Middle East contractor turned reclusive self published author and blacksmith/artist, I can attest to the trials and tribulations of getting a book written and self published. Especially the importance of ignoring the reviews. A warning was put out not to read my book by a 4,000 plus member Facebook survival page with in 24 hrs of it’s release. That was a shock! I’ve been burned out on all the prepper/survivalist books flooding the market about some lonely hero on the road trying to get back to somewhere with his trusty rifle and bug-out bag during a (insert trendy SHTF disaster here) since the 80’s. However, this interview gives me a spark of interest to check out this author because we share the same orthodontist fear. Great advice in this podcast for self publishing and self promotion. Cheers to ITRH! Is there or will there be a sequel to the last tribe ??? There’s still so much left to cover . flying back to Cali for one . I would just love for a continuation of this story . Yes!! I want a sequel too! It would be great to catch up with the characters say 10 years after they arrived in Hawaii.